A longboard is similar to a skateboard, except it is much longer in shape. The best longboards often tend to be much faster as well because of the wheel sizes. Longboards are mainly used for downhill racing, long distance racing, slalom racing, cruising,sliding, dancing and transporting. Longboards tend to be diverse in types and shapes so it can be hard to distinguish which one to get that will suit you the best. There are still some certain things which will help you in narrowing down your options. 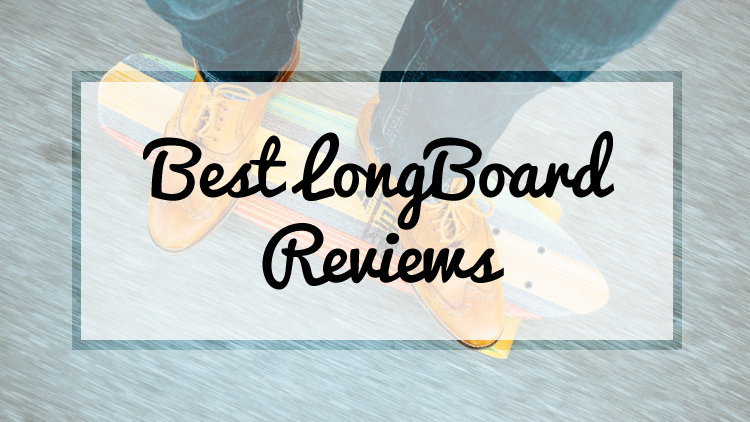 Before we do anything extreme, let’s have a quick look at 10 of the most promising and best longboards in the market available right now! This longboard measures up to 36’’X9’’. 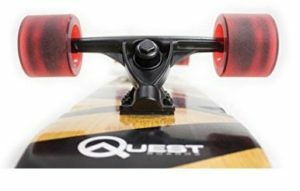 The specifications are a drop through trucks, medium concave with a directional shape, which makes the longboard great for commuting or long distance riding as well as carving. There are multiple levels of bamboo and Canadian maple veneers that make the longboard pretty heavy and stiff. There are heat transferred graphics on the board that makes it look edgy and fun. The veneer is done with clear grip tape. There are 180 mm or 7 inches aluminum trucks that make up for ultra high rebound bushings. These are designed with matte black finish to give that extra oomph. The urethane wheels are high rebound and they measure up to 70 mm X 50 mm. There are fast and durable Abec 9 Hellion bearings with built-in spacers in the longboard. The quality of the build is very good. The size is perfect for riders with minimum 5’3’’ height. Well built bamboo deck with a spray on a high grip. Affordable and worthy of the price. Wheels are not top of the market. The deck of this longboard is done with maple. The graphic has been transferred with photo heat transfer method and it looks uber chic. Whether you use this for commuting or showing off your dancing tricks, this design will definitely catch a lot of attention. The trucks have a 40 degree base with 180 mm hangers along with aluminum die casting trucks. The wheels are Volador special wheels. These wheels are 70 mm in diameter with a width of 51 mm. other than that they are 78A and SHR 70% rebound. The bearings are ABEC 9 with high-speed lubricant, which is the perfect choice for enjoying the free riding experience. The grip is coarse OS780. Equipped with the 70 mm caving wheels and ABEC 9 speed bushing, the rider can easily set up their standard to that of a professional rider. The 42’’ X 9’’ camber concave make up for a super flexible deck, making it a perfect choice for both commuting and cruising with freeriding and freestyling. Able to cut corners with ease. Fair weight for a longboard of this size. Some users cracked the deck within the hour. This board is designed with those going for downhill riding with a wide turning radius. The lowered platform to the ground allows for a great stability even at high speed. The shape is specifically designed for the riders who are looking for more support on the hard turns. The size measures 40 inches by 10 inches. The concave drop through is laminated with 9 ply Canadian maple wood. The speed cruiser board has 70 mm by 52 mm wheels with 78A hardness. The heavy-duty trucks are HD7 in 9.675 inches. The hanger is 180 mm and constructed with aluminum alloy. The package comes with a fully assembled and ready to ride the longboard. This board will be great for doing long distance riding or commuting. Very reasonable price compared to the features of the priciest ones in the market. Great starter board for the beginners. Wheels can tackle small bumps. Board has a lot of flex to it. Bearings are not that great. Trucks can be super hard to turn if the wheels are not adjusted. The trucks make sneaking noises while riding. Available in many designs and colors, the 44 inches long artisan board is made from bamboo. The design was done in Los Angeles to give it a vintage California look. The trucks are rugged at the same time lightweight with the 7 inches aluminum trucks. These lightweight yet solid aluminum trucks come with riser pads to reduce the vibration for a stable and surf like riding experience. The wheels have an anti-bite technology the wheel bite will be avoided. The wheel wells were added to eliminate the grab off the ground. The ABEC 7 tolerance grade of the board is ideal for extreme running with high speed. The Canadian maple and bamboo veneers are 8 plies to get a mixture of strength and pliability in the construction of this deck. This board will enhance the rider’s flow with smooth and shock absorbent 70 mm polyurethane wheels. They also come with a rock finish to provide a superior grip. Stable ride with a strong and solid veneer made of Canadian maple and bamboo. Superior grip with 70 mm wheels. High speed and accuracy with precision ball bearings. Board makes noises while riding. This longboard is made for the one with style. The longboard is 44 inches in length. It is laminated with bamboo. The design is artisan and these are available in three attractive colors, black, green and purple. The rugged and lightweight aluminum trucks are 6 inches in diameter with precision ABEC 7 bearings and hollow 4 mm risers. The wheels are made with durable PU with 80A configuration. The wheels measure to 70 mm X 51 mm. the wheels result in smooth riding thanks to the truck configuration. 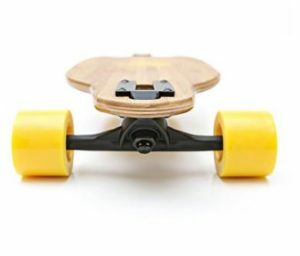 The longboard has wheel wells to prevent the wheels from getting Wheel Bites on the extreme turns, kick tail and nose performances. The veneer is done with both hardwood maple and bamboo so the deck is an artisan multi ply hardwood maple and bamboo deck. Multi ply deck with hardwood maple and bamboo. Artisan design with a solid base. Wheels make up for smooth riding experience. The wheels can’t handle debris. The bearings and brushings need replacement. 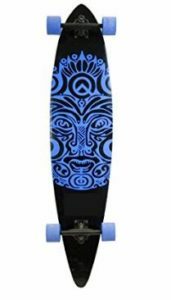 As should be obvious from the name itself this longboard is made for the professional and advanced level riders so beginners should stay put for this one. 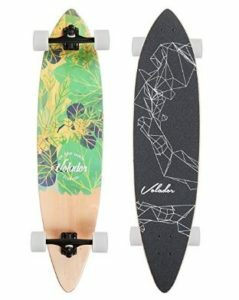 These longboards are available in both varieties – drop down and drop through and you should choose the one that best suits your style and ability level. The deck is made with hard rock maple so it is going to be durable for years to come. The trucks are made with aluminum and 7 inches inverted trucks. There is high bounce and flat spot resistance in the 70 mm PU wheels. The bearings are the precision SCSK8 ABEC 9 kind. This longboard can be used by anyone and everyone as it is a unisex product. The maximum weight limit of this longboard is 220 pounds. The package includes one pre-assembled complete longboard so need to worry about assembly or any sorts of tools. Wheels provide high bounce and flat spot resistance. Great turning ability with the flexibility of going over bumps. The bearings are cheap and need to be replaced. This bomb board is one unique piece of longboard as it incorporates the Hawaiian surfing culture of the 60s and made a fusion of snowboarding, surfing and skating with this one. This bomb board can be the ultimate solution for your longboard wishes as it is ideal for both beginners as well as intermediate surfers. 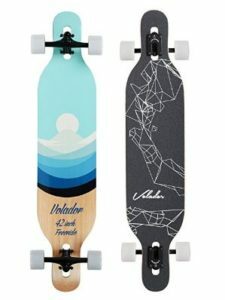 The design of the longboard is a double drop, meaning it is capable of offering unique control, speed, and safety along with durability. The drop-down deck of the longboard lowers the center of the gravity of the foot platform. This, in turn, increases the stability while the drop through ends of the deck provides the rider with extra curving power. The sticky grip deck is made with 9 layers so it is quite strong as a result. The length of the board is concave, which results in the full heel and toe control for the rider. The wheels are 70 mm high rebound and made with polyurethane. The bearings are ABEC 9. The 7 inches aluminum trucks provide smooth control over speed. Wheels make up for smooth sailing. Drop through and drop down deck gives extra curving ability. Can’t go over cracked pavements. These longboards make up for being super trendy looking and being available in numerous designs and colors. These longboards come in drop down deck with drop through ends that result in smooth riding even while doing curving. The curving can be done with edge with the addition of the wheels as well. The deck is made with 7 layers of hardwood maple wood so you know it is going to last you through the years. The trucks are aluminum made with 7 inches inverted design. The PU wheels result in high bounce with flat surface resistance. These wheels are 70 mm in diameter. The bearings are the precision SCSK8 ABEC 9 kind with SCSK8 pro black grip tape for giving the ride superior grip with the pavement even during harsher turns. The maximum weight limit of this longboard is 220 pounds. The package includes one pre-assembled complete longboard so you don’t need any type of tools to get this done. Can go over small and large bumps as the flexibility is high. The pro black grip tape makes turning smoother and easier. The bearings are cheap and will need to be replaced after a couple of uses. Wheels are not ideal for power sliding. As some things are instantly clear from the name itself, this longboard is suitable for downhill riding and is in fact recommended for not complete beginners. The length of the longboard is 40 inches. The deck is made with maple wood for giving it a solid base with high stability. The designs are super attractive and done with photo heat transfer method to make the graphics pop out. The grip on the deck is Coarse OS780. The trucks have 40 degrees turning base with 180 mm hanger range. The wheels are specially produced by Volador. The wheels measure to 51 mm in width and 70 mm in diameter. The bearings have high speed lubricant with ABEC 9, so it is possible to ride at the high speed as well as do free riding and free styling stunts to show off your skills in style. The attractive graphics of the deck surely come in handy at that time as you suddenly become a star. The deck is very solid and stable. Cutting the corners is smooth and can be done with ease. Wheels are capable of making smooth ride even over crumbly pavements. Can be used for downhill riding. The wheels make annoying squeaky noise. The bearings are not the best and need to be replaced. The deck cracks under heavy usage. Getting the best longboard is not so easy. You need to think about a lot of factors if you want to make it a good decision. Here are some of the important ones. Based on your ability, you can choose the best longboards for you as there are shapes, styles and setups made for each level of riding ability. Be realistic before assessing your own skills and if it hard, try asking your riding buddies to get a better answer. There are a couple of riding styles within the longboarding sport. Based on your preference, you should get a longboard that will best suit your riding style. Here are some riding styles described down below for better insight. The cruising or carving style is the style of carving down gradually along the sloped streets or long distance pushes on slightly sloped or flat grounds. If you are new in the longboarding business, this is the most popular type of riding to begin with. This is the style where the longbording is done by bombing the hills as fast as possible while keeping the control. Riders are usually riding in a crouched position to reduce the resistance of wind and increase the stability of the rider. It is not uncommon to break the wheels out in a slide to control the speed so downhill is not the best option for the beginners. This is the riding style where the rider rides hills with their best longboards with a fair amount of speed while styling it with a few curb hops and slides. This also requires sliding to control the speed on bigger descents. This style needs quite a bit of skill and practice to control at high speed so it is generally done by more expert riders rather than the beginners. Freestyling involves mostly technical skills incorporated together to add in more style and flare to the riding. It involves many skills at once such as board tricks, regular riding, dancing, sliding etc. among others. This type of style is helpful for the beginners to acquire the board control skills but it can be super fun to the expert riders as well. There are generally two shapes of best longboards which most designers use for the riders. Both shapes can be simultaneously used by beginners and advanced level riders. The directional shaped boards only go in the forward direction, hence the name, as it can’t go in any other direction or change the path while the rider is riding it. The most popular directional board design is called the Pin Tail that doesn’t give proper feel or control when the rider has switched directions. 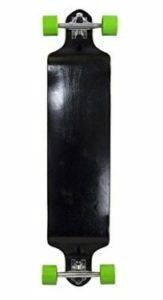 The cruisers, downhill boarders and carvers generally use these directional shaped longboards with a few exceptions. A twin or symmetrical board looks and feels the same way no matter which way the board is facing. A symmetrical board should be your choice if you plan on doing slides that require you to do 189 degree slides. For example, in free riding and freestyle riding, you will need a twin or symmetrical board. Deck styles are a major decider in making the board stable, easy to push or foot brake in the ground etc. as the general rule of thumb, the higher the board is off the ground, the higher is the center of gravity going to be. This means the rider will be getting more fatigue and less stability while foot braking and pushing. On the opposite side, the lower the board, the less average you have to toss quick carves and you are more likely to bottom out on the tight turns. This is the most traditional shape of the best longbaords, and it is also the most affordable one. The deck part is mounted on the above of the truck so the center of gravity is higher than that of other styles of boards. This means that the top mount is slightly less stable but more nimble while compared to the dropped boards because there is an increase in turn leverage. Top mount boards are the most versatile kind of longboards as these can be used for carving, downhill, free ride, free styling and cruising, which are more common and popular among the riders. In this type of style, the trucks are mounted on the board, hence the name. This style of mount efficiently lowers the height of the deck by the thickness of the board. This helps in increasing the stability of the board and reducing the fatigue of the rider while pushing or braking. This happens because in this case, the rider has to drop their foot less to get in contact with the ground. 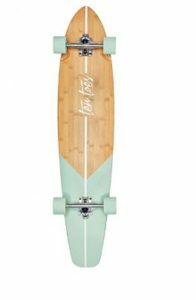 These types of best longboards are great for commuting or long-distance riding, downhill riding and free riding styles. These decks are molded during the construction in such a way that the area where the rider’s feet rest is seated below the truck area of the longboard. This is a great method for lowering the center of gravity for less fatigue with increased stability while pushing or braking. The drop amount is usually found out in inches. The drop decks style is generally found in free ride and downhill boards. Drop deck boards’ trucks are mounted on the top. This style features both drop deck style as well as drop through trucks style to get the rider’s feet as close to the ground as possible. This is the most stable deck style among the ones mentioned before even though it is the least common one due to the high degree of difficulty to construct, which in turn makes this the most expensive one. This type of shape is commonly found in dedicated downhill longboards. All boards come with some sort of distinct shape feature that provides a specific type of riding characteristic and help dictate each of the board’s intended use. These features include many shapes such as wheel cutouts, concave and kick tails. There can be wheel wells as well. Both wheel cut outs and wheel wells are good for preventing the wheel bite. A wheel bite happens when the rider corner too hard and the wheels contact the deck. This usually results in getting the rider being thrown off the longboard, which can be detrimental, obviously. Cut outs generally allow for turning the hardest way as there is no way for the wheels to make the board contact. Wheel wells allow the rider to turn sharp but still allow for contact if the trucks are too loose or the risers are not large enough or the wheels are too big. Concave helps a bit in keeping the feet on the board. By concave, usually means that the edge or the rails of the best longboards are a little higher than the center of the board. When standing on the board, the rider’s feet will contour to the shape. This will increase the contact area of the shoe, which will result in more grip. 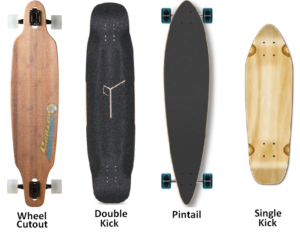 The concave amount generally depends on the designated riding style of the board. Free riding and downhill boards generally have deeper and more extreme concave than that of cruisers. Similar to the regular concave, W – concave keeps the rider’s feet planted on the board without any issues. It is like having two concave sections right next to each other and this obviously provides a lot more grip. This feature is generally only associated with the free ride and downhill boards. Kick tails are more commonly what we see on the both ends of regular skateboards. This allows the rider to lift one end of the board off the ground to perform tricks with style or to make quick turns. The best longboards can have kick tails at just one end in case of directional boards and on both ends in case of symmetrical boards. 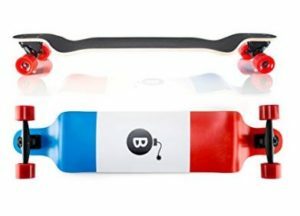 These can be a necessity for many free styling boards and great for cruiser boards while doing commuting or long distance riding to avoid a last minute collision with a pedestrian or vehicles. This plays a key factor is gaining stability and turning. Longer boards or longer wheelbases generally provide more stability at even a higher speed but can’t turn as fast or as hard as boards with shorter wheelbases. The construction or making of the longboard is equally important factor to know before you make the final decision for purchase. The most common and affordable board construction uses multiple layers of thin sheets which are made with maple or Baltic birch wood. These are called Veneers. The Veneers are stacked on top of each other by gluing together and later pressed into a shape. The number of Veneers varies between boards. As an obvious rule of thumb, the more Veneers are used, the heavier and stiffer the board is. Laminates are made with different materials for different boards but bamboo ones are gaining popularity these days. A sheet of vertically laminated bamboo is first wrapped or sandwiched in composite materials, typically fiberglass. This generally produces the best longboards with medium to lightweight weight with soft to medium flex. These have powerful spring to them and are more popular among the riders. The last and the most expensive type of construction is done with composite materials, mainly carbon fiber. A lightweight wood, in many cases bamboo, is combined with a piece of foam to create a lightweight core. Later this is wrapped in a composite material to add more rigidness. 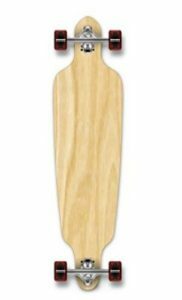 These types of boards are known for their light weight and stiffness. These are taken by serious downhill riders. Boards come in many different types of flex ratings and each one of them is numerous in their characteristics. Many factors such as length, amount of concave, material, lamination etc. are taken into account to measure the flex of the board. The best longboards are diverse in flexing nature. We can namely differentiate them into three types – soft, medium and stiff. The soft flex has great shock absorption on the rough grounds. These can be unstable at the medium or high speed. These can be super fun for slow cruising and certain type of board tricks. The medium flex is good for maintaining the stability at high speed. The flex gives a spring-like feel that can add energy to curves and pushes. These are great for carving, commuting and moderate speed cruising. These types of flex are the most stable at moderate to high speeds. These can be the least suitable for cracked or bumpy grounds. This is the best for going fast, free riding and for bombing hills. 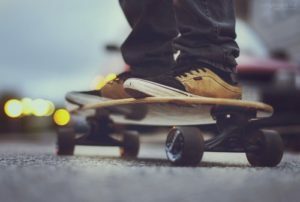 Wheels play a major role in how well the longboard performs as they are the connector that provides the grip between the road and the rider. This also affects the speed and cornering ability. There are different factors that dictate how the wheels will perform. These factors are diverse in nature and will be described in short. There are two types: round and square. Round wheels are seen on skateboards. The edge of the wheel is round which provides less traction doing turns. These are easier to slide, making them the first choice for freestylers and free riders. If you are a beginner, this should be your choice. The edge is at a 90 degrees angle, resulting in better traction and sliding resistance. So there you go. That was our guide for the best longboards out there. The best longboards are capable of giving the rider a whole lot of fun and exhilarating experience along with learning some great techniques. 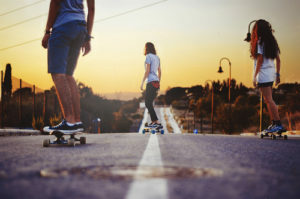 However, the best longboards will vary from person to person depending on the individual style and ability and thus should be chosen with caution.